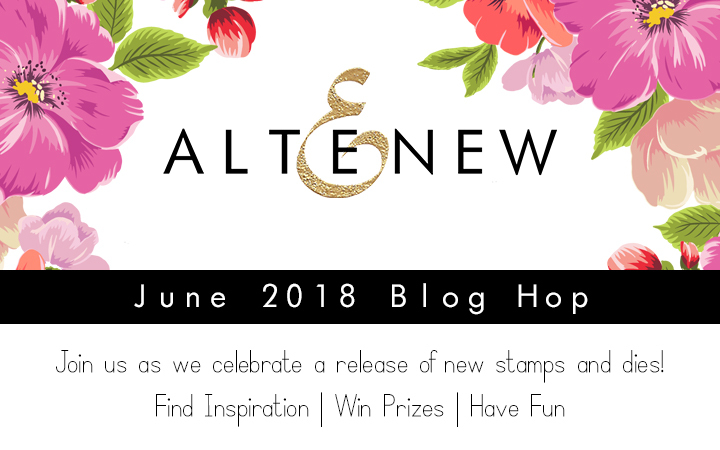 Welcome to the Altenew June 2018 Stamp/Die Release Blog Hop. I am honoured to be asked to join in on another release hop and I have one project to share with you today. If you have already been hopping along, you should have arrived here from Therese Calvird's blog! 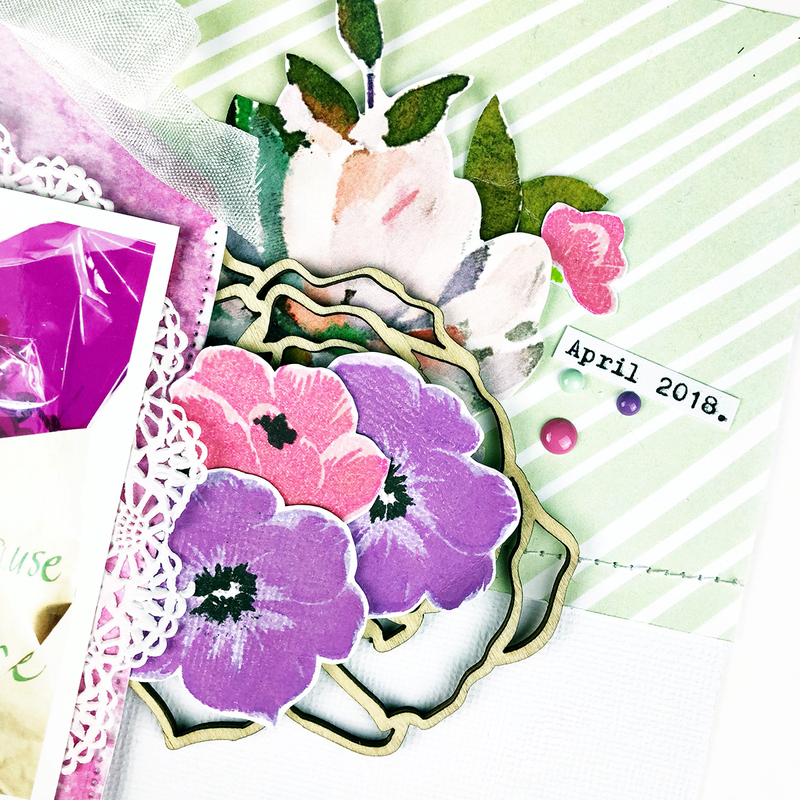 For this blog hop I have played with a couple of new release products. The featured product being the new Climbing Clematis stamp set. This set teamed with the Our Family Scrapbook kit worked beautifully together. 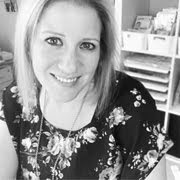 Keep reading to see my layout and also the two ways you can win gift certificates to spend in the Altenew Store. Before I begin you can see the entire June Release, click HERE. I have also teamed my projects with the 'Our Family' scrapbooking collection from the store. I am documenting a beautiful gesture by one of my colleagues at work today. Sometimes a little act of kindness can change your whole mindset and set you back on the right track. To help the photo stand out as the feature for the layout I used the new Party Banner Die, but instead turned that into a tag and added some ribbon to the top. I stamped the Climbing Clematis stamp set onto white textured card stock and clustered those to the right of the photo. I stamped with pink and purple inks to coordinate best with my photo. Other embellishments on the page were from the Our Family kit, including the fussy cut florals cut from one of the papers in the kit. Here is a close up of the journaling, I used my typewriter to document this story. The textured card stock adds a subtle detail to the stamped florals that I like the look of. I also love the stamped florals when they have that white border around them, I think it really helps them to stand out. There are two ways you can enter this hop today! 1/ To celebrate this release, Altenew is giving away a $50 gift certificate to 6 lucky winners! 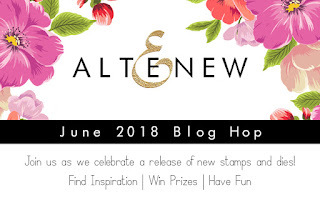 Please leave a comment on the Altenew Card Blog and/or Altenew Scrapbook Blog by Wednesday, June 20th for a chance to win. 6 winners will be announced on the Altenew blogs on 6/24/2018. 2/ You can also win a $30 gift certificate to the Altenew store by simply leaving a comment on this post! I appreciate all the lovely comments, thank you! I will announce a winner here on my blog by 6/20/2018. Your next stop is Yoonsun Hur - thanks for stopping by today!!!! That is such an incredible way to remember a wonderful heart felt gesture. And such beautiful colors. I hope you are having an awesome week. love the layers, great work! I love this. And I love where your creativity came from! You are right, the textured paper really makes those flowers unique. Love it! Beautiful work! 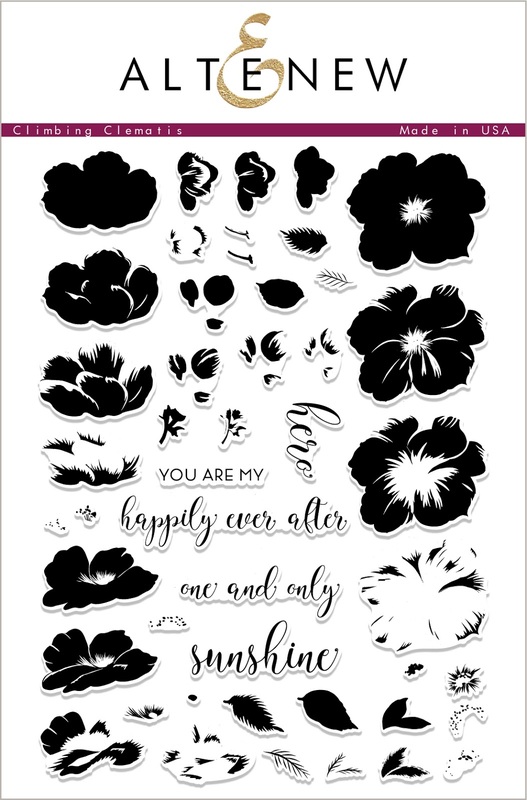 Love the layout ...beautiful flowers...I am loving all the altenew stamps and dies. What a unique idea! Love the colours you used! Beautiful layout, and what a beautiful gesture by your colleague! Beautiful project! Thank you for the inspiration! What a lovely project! So beautiful!! So pretty - love the clematis set. Love your fabulous layout! And what a lovely gift, too, and such a thoughtful gesture. Beautiful layout. You make it look so easy to do. I love your project. Very pretty. Not only is it pretty but makes a sad day, a happy one. What a great project , Raquel. Love all the lovely colors! Beautiful page, love the bouquet of clematis you made and the Tall Alpha colored die cuts for GIFT, and what a wonderful colleague. What a STUNNING page!! I love how you used the clematis on this!! What a sweet page! Love those floral stamps. Lovely layout. Love the colors and the layout of the text. I love the dimension you gave to the lay out! The colors on it are so pretty! Wow this is such a beautiful way to showcase a photo! 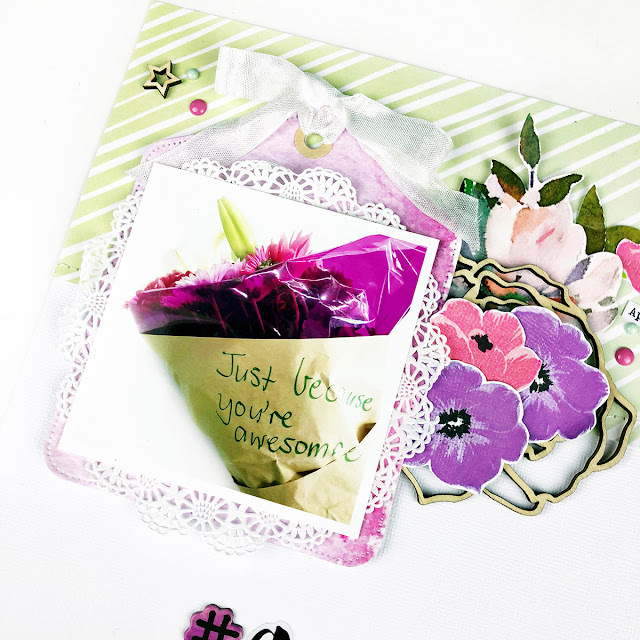 Gorgeous layout - I love how you matched the flower colours to the picture - the flow is seamless! I love your layout! It’s so cute and and those clematis’ are my favourite floral for this release! Great job! Very kind co-worker too! I love that you documented this in such a beautiful way! I'm off to continue to hop! Such a beautiful layout! Love this! So elegant. I love this. What a wonderful gesture from a co-worker. You must be much liked there. I think the page you've made to document it & remember it over the years is just lovely. Great use of some of the release. I love your layout. It would be wonderful to look back down the road if you are having a bad day and it would be an instant pick me up. Love to see the sets used in layouts. I get stuck a lot trying to figure how to use them Thanks for sharing. Such a beautiful page. I always use my stamps for cards, never think to use them on LO’s. Will have to try that. You do beautiful work - love your creativity. How beautiful and how kind of someone to catch you off guard. What a lovely person. Love the way you've showcased this.. Love the new banner dies! I'm sure your thoughtful gift made your coworker's day a little brighter too! Love how you used the banner die as a tag. You are very creative and an inspiration. Thanks for sharing your fun inspiration! A lovely layout Raquel and a very thoughtful gift from your co-worker. 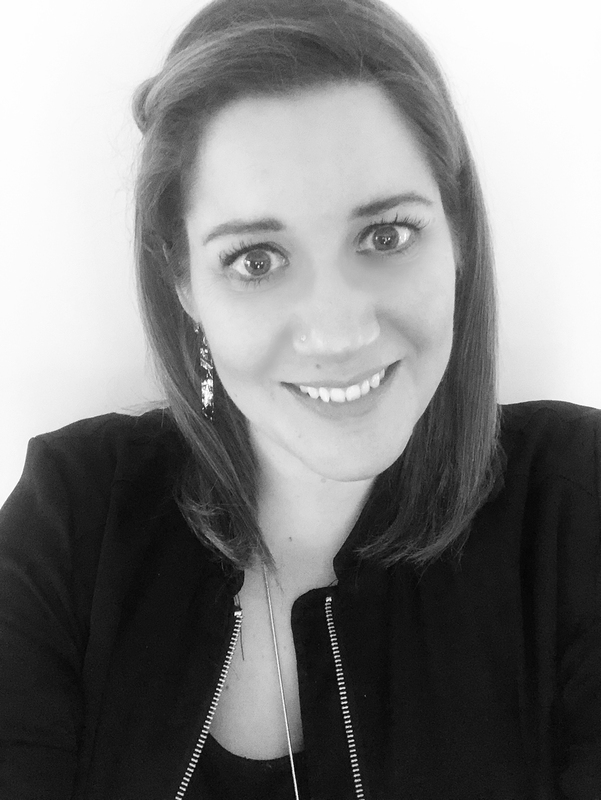 lovely inspiration, Raquel - so pretty! This is just a beautiful layout! How nice of your colleague to bring you some cheer! 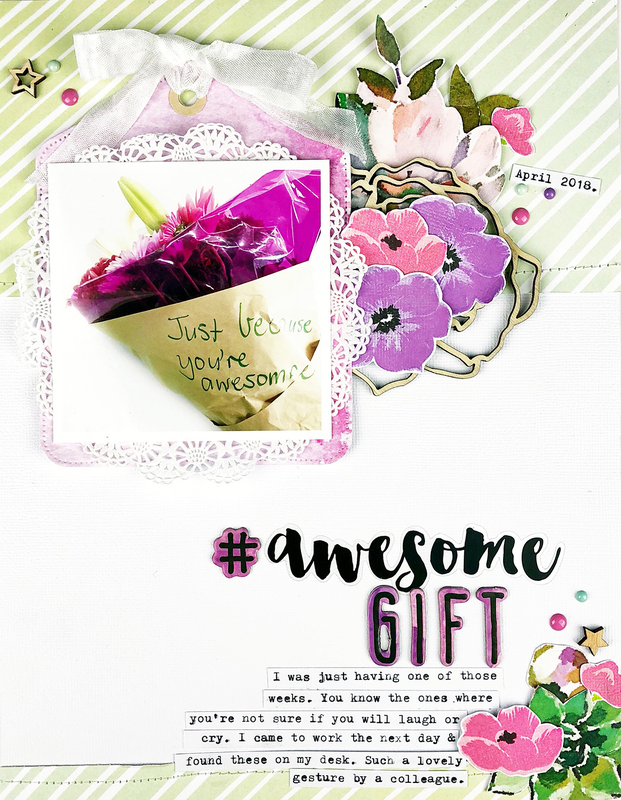 Beautiful layout for a beautiful gift! Your design is perfect for that photo! what a great release with so much potential. thanks as always for sharing. Another wonderful release with some really unique stamps and dies. Love it! Thanks for the wonderful inspiration. Your layout is beautiful! You've really shown the versatility of the Climbing Clematis set. Such a gorgeous card. Beautiful colors and layout. Thanks for sharing. Gorgeous layout! What a perfect accent for that lovely photo and story. Stunning layout! This makes me want to start scrapbooking again! What a fun layout and a great mirror of the story that you're recording with the flowers and the textured paper. Perfect marriage of subject and medium. Thanks for sharing both the layout and the story with us. It makes me smile that someone would do that. Such a pretty layout! Love the colors& great design! A very thoughtful gift. Love the design and colors. Like how you used different medium to create the layers. Great layout. I love the colors and the pretty layers. The doily behind the pic is really sweet. I love your layout! So pretty! Love that your nails matched your enamel dots too!! Thanks for the inspiration! Oh, I love how you turned the banner into a tag... sweet! The flowers are gorgeous... love the pretty colors. Your layout turned out really pretty! 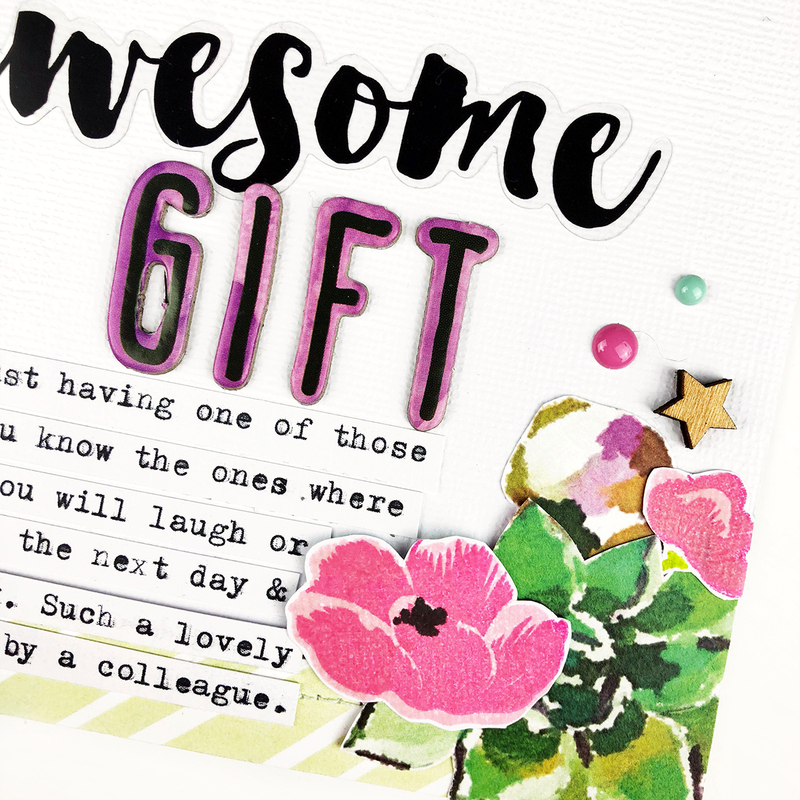 So nice that you have a coworker who is so wonderful!! I've had a few weeks like that myself, so it is nice to have someone know where you are coming from! Hope everything is better at work for you! I love how bright that layout is and the stamped flowers are perfect! 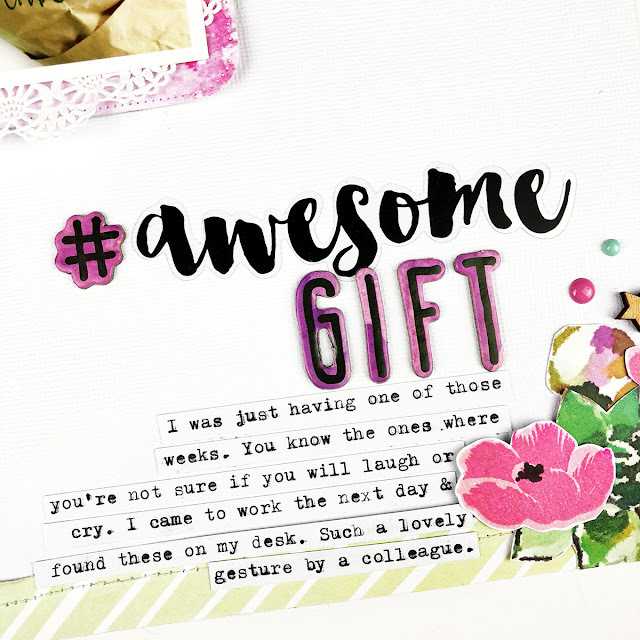 Great idea to document auch a lovely and thoughtful gift. I agree a little kindness goes a long way! Thanks for sharing Raquel! Love those beautiful flowers! Pretty layout! I love the layout and all the gorgeous details using the new releases!! Can't get enough of your inspiration! Love the layout!! What a wonderful gift! Such a gorgeous layout. I MUST start to add these beautiful florals to my layouts, instead of just my cards! Thank you for the wonderful inspiration. Ah, I just love florals! So many beautiful colours on this fab layout. Thanks for the inspiration. What a wonderful gift from a thoughtful co-worker. And a great way to show it off with a great photo too.